Huge progress this week in only 4 and a half days of framing, the Modern Bungalow is starting to take shape now with the whole first floor and garage framed up. I haven’t seen anyone doing this in San Diego, my architect is doing these in Austin, Texas and this is the hottest new construction style for the old metro neighborhoods. The house will still have the classic lines of a bungalow but mashed with modern construction and design features. Everyone loves bungalows but this twist is going to give you the best of both worlds with contemporary style being the most popular right now in the home design world. The underground plumbing, floor system and insulation inspection went a little better the second time on Monday, my regular inspector said everything looked good and he wouldn’t have made me change the sanitee fitting to pass. 3 more signatures on the card and we were able to get the 3/4″ T&G CDX subfloor down. We put up the North living room wall first and then the front, or East kitchen wall. Notice the 10 foot ceilings downstairs and the 8 foot door heights. We also made all the windows a little taller and lined them up at the 8 foot door height as well. The doors and windows are as high as most peoples ceilings, it makes the house feel so much more expansive. My framers thought I was crazy and never even do 8 foot doors, normally its reserved for McMansions and is popular in Phoenix and Texas so its probably safe to say this is a first for South Park. The coolest thing ever is walking in the front door and looking straight back at the green canyon through the custom 9 foot wide by 8 foot high patio slider doors. The highlight of the week was lifting up the 19′ balloon wall. Its the exterior wall on the driveway side of the house that reaches all the way to the roof trusses because there is a stairway in this location. You can see the 3 headers that follow the staircase up. It took 9 guys to lift the wall in place it was so heavy with my over sized material. 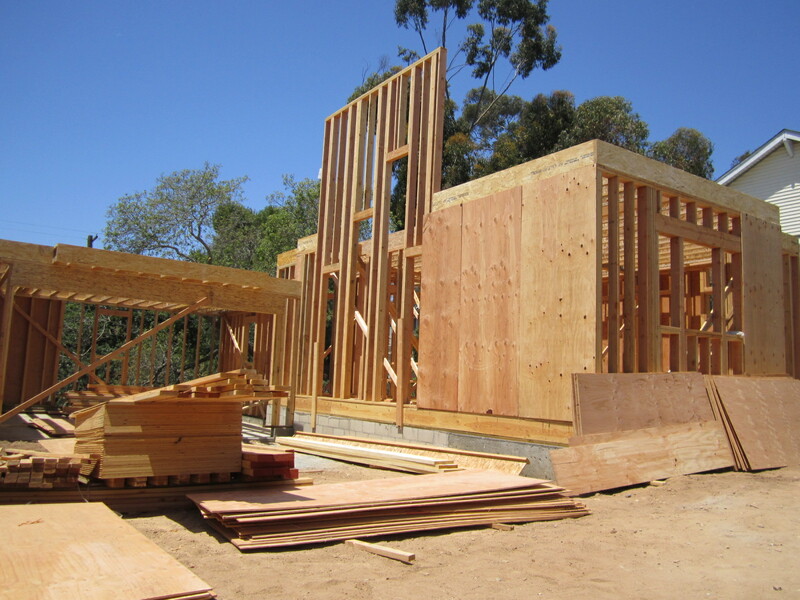 For this house I’m using 2x6 framing for all exterior walls instead of standard 2x4. Besides being structurally superior, this will give me room for a greater insulation barrier for huge energy savings and provide better sound proofing from the nearby flight pattern. Some builders move spacing on wall studs out to 24″ when they go to 2x6 but I left them at 16″ on center. A friend of mine who works for a large National home builder called it a energy saving fortress. Upstairs I used engineered I joists from Trus Joist. 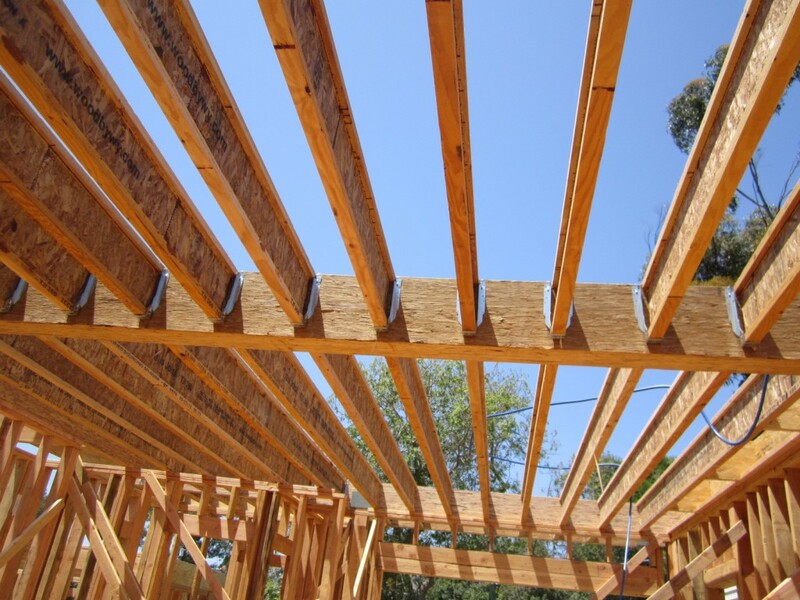 These TJI joists are the highest quality available and resist warping, twisting and shrinking to prevent bouncy or squeaky floors. Besides allowing greater spans from the engineering, one nice thing is you don’t have to crown the wood, they are all perfectly straight and will give a perfectly flat floor upstairs. 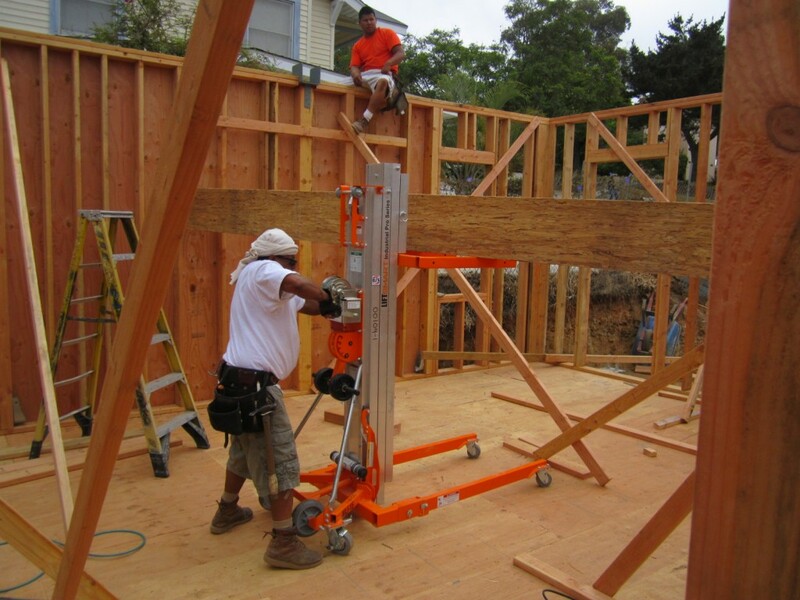 I’ll fir down each joist so the 14″ beam wont show when we drywall the ceiling in the living room. 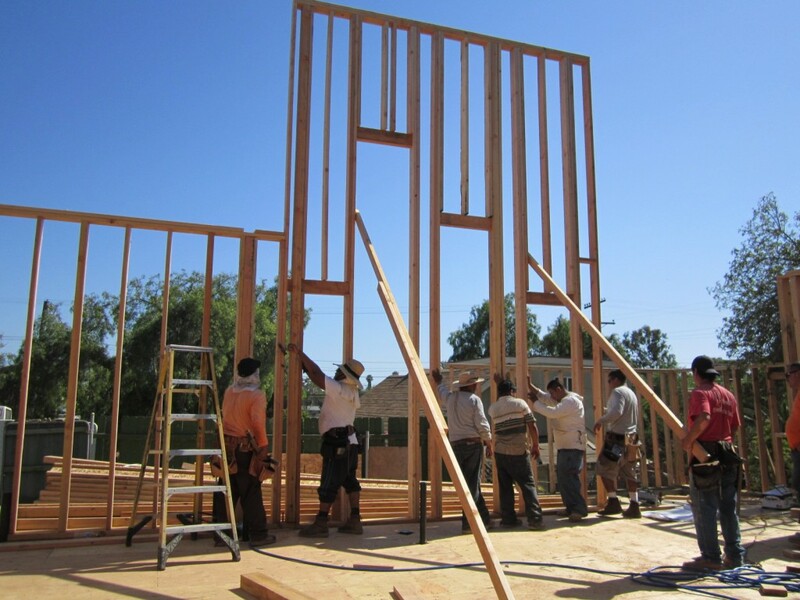 In the shear wall locations I’m also using CDX instead of OSB. You can see how large the house is looking here with just the first floor up. It’s going to dwarf the 2-story bungalow next door. Seeing this huge 2-car attached garage and wide driveway is also very atypical for the neighborhood, of course I did a 8′ high garage door to accommodate my truck. Notice also here how the 9′ high garage ceiling height is lower than the second floor, this is where steps lead down to the master suite from the secondary living space to provide a little more interest and privacy. I’m so happy with this cutting edge design, there’s going to be so many cool things going on when its complete to make this a real cool property. 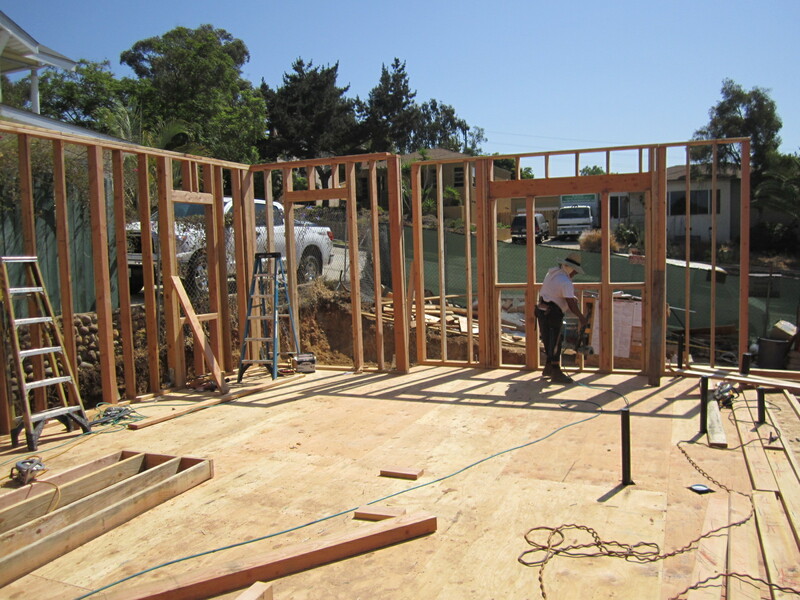 We are ready to start the second floor framing this week, there are more cool design features that I cant wait to see take shape. I planned on 2 weeks for rough framing but it will probably stretch out a little longer with all the small pick up work to be done at the end. Looking great Tom. I really appreciate the explanations behind what you are doing and cant wait to stop by and check the place out. I have a feeling this house will be around for a very long time! Haha TJ. You know me, why use 2×4’s when I can use 2×6’s. The extra cost is nominal in the big picture. I want better insulation so this is the best way to get it. Beautiful work. This is going to be a showpiece. Thank you so much for sharing all the details. You are doing amazing upgrades to this house. The energy saving measures I’m taking all count toward an end score if you will, that will affect electricity bills for my family. Nice. I’m sure the new owners will be very appreciative of that. I’m sure the neighbors are talking it up as well. 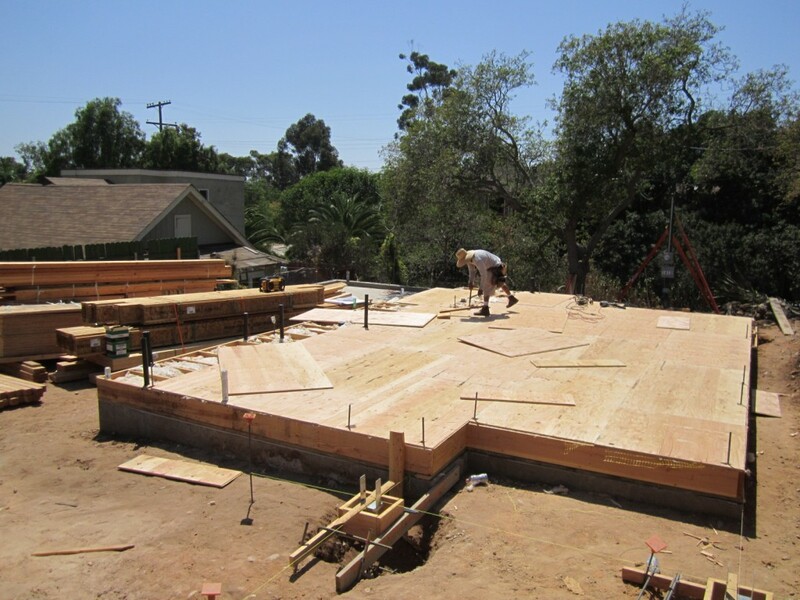 Tom, There are 19 homes going up in Leucadia. The architecture is unusual. Here’s a link: Do you think they fall into the modern bungalow category? Hey Paul, great find. yes I would say they do fall into this new category. Thanks for sending the link, I’m going to investigate further and watch that project. I’ve heard of City Ventures Developers but cant remember where. Thanks for posting!